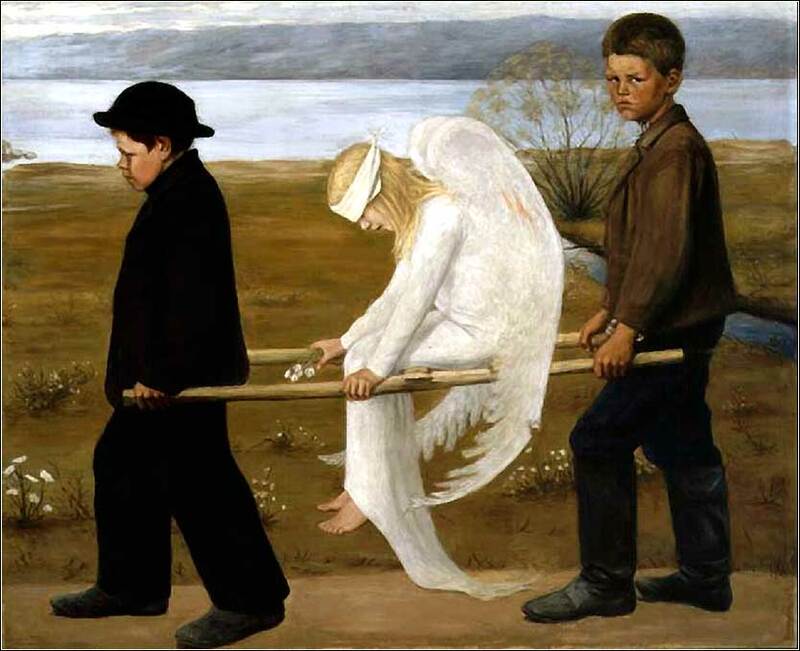 Wounded Angel by Hugo Simberg ca. 1903. This darkly symbolic comment on modern society was voted Finland’s “National Painting” in 2006. Josh Garrels urges us to conform our lives to the Bible — to abandon “Babylon” and embrace “Zion” — in a 60s-style “social protest” song. And what I want to waste. Orphans, widows, and homeless graves. I sold their souls just to build my private mansion. Down, down, down on me. Because I love my Babylon. I am a slave, I was never free. I betrayed you for blood money. Oh my Lord I’m your enemy. Come to me, and find your life. Children sing, Zion’s in sight. Mine is the Lord, and yours is my child. Give to the poor all that you own. Lose your life, so that you could find it. Faith, hope, love, and harmony. I said let this world know me by your love. On your way to Mount Zion. Come on out child and come on home to me. If you can hear me then follow my voice. Almighty God, I commend to your gracious care and keeping all the men and women of our armed forces at home and abroad; for those who fight fires and crime; and for all those who put themselves in danger for our protection. 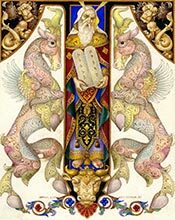 Defend them day by day with your heavenly grace; strengthen them in their trials and temptations; give them courage to face the perils which beset them; and grant them a sense of your abiding presence wherever they may be; through Jesus Christ our Lord. 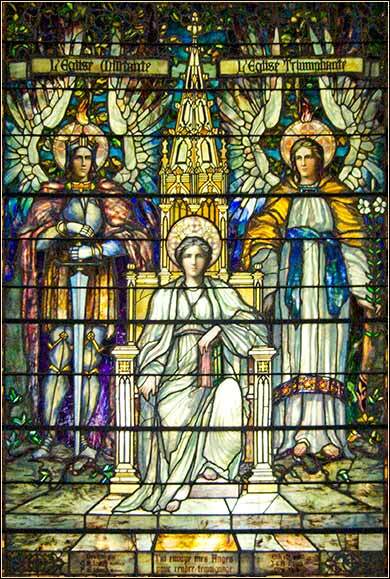 Religion Enthroned by Frederic and Charles Lamb, ca. 1900. As we mentioned yesterday, there are two valid ways to interpret the physical events of the temptation: That Satan physically flew Jesus to several places, or that the battle took place internally in Jesus' human mind. This second idea is not “modernist” theology, which feels free to rewrite the Bible. Even the more conservative theologians agree that Christ was fully human and had a human mind, which would have been as broken down as his body after his long fast in the desert. It is this very humanity that makes him so incredible, because it allowed him to be as fully tempted as you or I. The emphasis on Christ's internal struggle highlights the power of the Spirit within him. He is fully human but can remain sinless, can resist temptation, no matter how badly he is tortured; even if his brain is rendered “broken” — and the purpose of torture is usually to do precisely that, to break down a person's mind so that their resistance to temptation is destroyed — Christ will not give in. He is incapable of sin. he third temptation is very different from the first two, for Satan did not tempt Christ to clear sinfulness, or offer Christ a reward, in the first two. In the third temptation, however, he dangles the ultimate bait: He offers to give Christ complete ownership of the world. This highlights Satan's power on earth, for one must own something to offer it as a gift. And indeed, Satan has dominion over the riches and lands of the world. Giving in to temptation and sin can bring us these very things: earthly power over other people, wealth, status, ownership. Why did the covenant of Moses fail? God offered the Hebrews what Satan offers Christ, complete dominion over (part of) the world, if they would worship Him. But they did not — the could not — hold up their end of the bargain. They could not resist sin, could not resist Satan's relentless, powerful gift of persuasiveness. The third temptation is a paradigm for what every one of us faces every day. Satan tries to convince us that we can better our life on earth by giving in to him. Perhaps William Jennings Bryan overstated the point when he said, “No one can earn a million dollars honestly,” but he makes the same point as today's Scripture. We might commit a small theft by omitting to include $100 cash payment on our income taxes; small sin, small reward. What might we do for $100 billion and absolute political control of the world? To have every man and woman do our bidding? Christ will not compromise with evil for anything this world has to offer. So the practical lesson of today's Scripture is: Refuse to compromise. “Put on the helmet of salvation and grasp the sword of the Spirit, which is the word of God.” (Ephesians 6:17) We will be forgiven for our sins, but we must not wink at them, pretend they do not exist. We may compromise where Christ did not, but we should not fool ourselves.